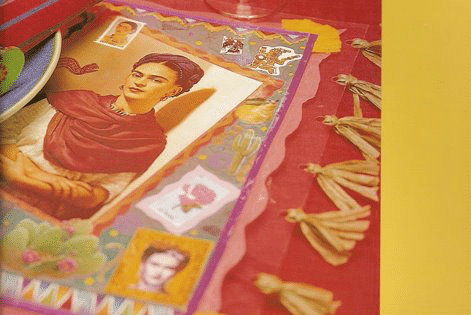 These Frida placemats are great for a party or for everyday use. No matter what, you can’t have boring place mats to go with your fancy home cooked menu! Devote some time to creating these artful collages that are laminated. You can use them all year round and they will add so much more spark and spirit to your life and decor. Trust me! This lovely project is from my book: The Crafty Chica Collection! Make the collage on the art paper and get it color-copied (times how many place settings you have) and then laminated. Punch holes along the sides and tie pieces of raffia. Use memory wire, beads and decoupaged wood charms for napkin rings.